Martha Swanton was the fourth daughter of Michael and Elizabeth Bradfield Swanton. She was baptized on June 28, 1857 in the Church of the Immaculate Conception in Enniskeane, County Cork, Ireland. When she was baptized, her family lived in the townland of Boulteen. In the 1900 Massachusetts Federal Census, it indicates that Martha immigrated to the United States in 1875, at the age of 18, and had been there for 25 years. However, the 1920 census indicated that Martha had immigrated in 1882. On February 6, 1883, Martha Swanton married Michael Crowley, a paver from Ireland. 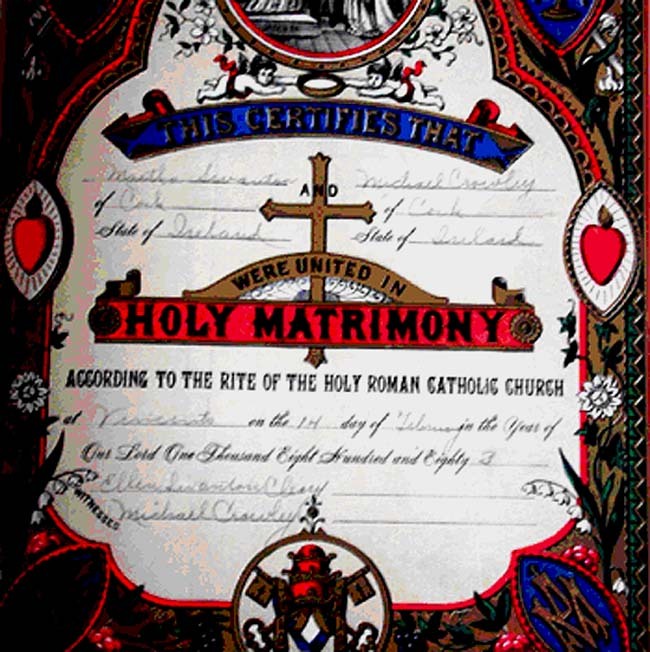 Martha Swanton and Michael Crowley were married in the Cathedral of the Holy Cross by Father L. M. Corcoran, a Catholic priest. Their marriage witnesses were Michael Crowley and Martha’s sister, Ellen Swanton Cleary. Michael Crowley was the son of Michael and Mary Crowley. Claire Crowley, Michael and Martha’s granddaughter, thought that Martha’s brother, William Swanton, had helped Michael Crowley come to the United States. Martha and Michael’s first child, Mary V. Crowley, was born on February 12, 1884. The family was living at 79 Bolton Street in South Boston, MA when she was born. Michael was working as a painter at the time. Their second child, Elizabeth, was born in 1886 and was named after Martha’s mother, Bessie Bradfield, who had died in 1885. Elizabeth Crowley died on August 11, 1887 at the age of 1 and was buried with her grandmother in Calvary Cemetery in Massachusetts. Their first son, Michael Crowley, was born in October of 1887. Their third daughter, Martha Crowley, was born on June 10, 1889. The family was now living at 306 W. Second St., South Boston, MA, the former home of Martha’s brother, John Swanton. John, Mary and their family were now living at 203 W. Third St., just one street over from Martha and Michael. Michael and Martha’s fourth daughter, Katherine, known as Kitty, was born in July of 1890. A second son arrived on February 15, 1893, and they named him John. John died when he was four years old of pneumonia. He was buried with his grandmother, Bessie Bradfield Swanton, in Calvary Cemetery. The family was still living at 306 W. Second St. in South Boston when he died. On June 9, 1896, their third son, Robert Crowley, was born, and the family was still living at 306 W. Second Street. On March 10, 1898, their fourth son, William (Willie) Crowley was born at the same address. On June 4, 1900, Martha and Michael Crowley and their family lived at 93 Baxter Street in South Boston. Michael was working as a house painter when he could find work. Martha stayed at home and took care of the house and the children. Their daughter, Mary, was now 16 and working as a stock-girl. Michael, Martha, Katherine were all at school, which they attended for nine months of the year, and little Willie, age 4, was home with his mother . Willie died when he was young. Claire Crowley, Martha's grand-daughter, remembers being told when she was young that Willie had been “left out in the snow” and died. Child psychology wasn’t very advanced in those days! Michael and Martha’s fifth son, Leo D. Crowley, was born on November 17, 1900. The family was now living at 90 E Street in South Boston. Michael Crowley became a naturalized citizen in 1902. He was still working as a house painter. In 1920, the Crowley family lived at 6 Marine Road in South Boston. Living with Michael and Martha were their children Katherine, 27, Robert, 23, Leo, 19, and their granddaughter, Margie, 8, daughter of Martha Crowley. Katherine was working as a laundry sorter, Robert was a truck chauffeur, and Leo was an automobile mechanic. Michael Crowley died between 1920 and 1927. In December of 1927, Martha and Michael Crowley lived at 180 Dorchester Street in South Boston. Their son, Leo, and their granddaughter Margaret (Margie) lived with them. Mary Lane lived at 25 Merrill Road in Worcester, MA, and Michael J. Crowley lived at 2334 Story Street in New York City. Kitty and Arthur Brousseau lived at 42 Essex Street, Cambridge. Robert Crowley lived at 2 Story Street in South Boston, where his son Robert Crowley still lived in 2001. On December 8, 1927, Martha Swanton Crowley suffered from a cerebral hemorrhage which rendered her incapable of taking care of herself. On December 22, 1927, her daughter, Kitty and her son, Robert, filed a petition with the Middlesex County Court requesting that Martha’s son, Leo D. Crowley, be appointed Martha’s guardian. This petition was supported by a signed statement from Dr. John MacDowell, which stated that Martha was insane due to this cerebral hemorrhage. Click here to view the Guardianship probate record for Martha Swanton Crowley. Martha Swanton Crowley died just three days later, at the age of 69, on Christmas day of 1927. The cause of death was cerebral thrombosis, 2 weeks, and broncho pneumonia, 2 days. Leo Crowley was appointed the administrator of Martha’s estate. Her estate was worth $1,808.84. 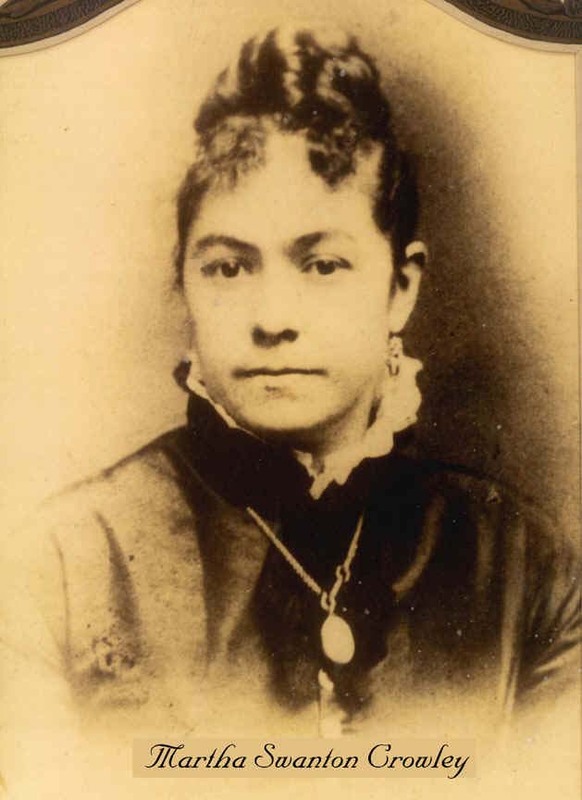 After her burial expenses of $432, the remainder was divided equally among Mary Lane, Michael J. Crowley, Leo D. Crowley, Katherine E. Brousseau, Robert L. Crowley and Margaret L. Crowley. They each received $229.49. Click here to view Martha Swanton Crowley's Will.